As in, no balls were intentionally thrown toward his head. That changed Monday, when Cardinals pitcher Eduardo Sanchez sent two breaking balls toward Wright’s noggin, just to see if he’d flinch before they fell away toward the strike zone. They might have been Sanchez’s own doing, or were perhaps ordered by Cardinals manager Tony La Russa (who, if he didn’t order the pitches directly, at least has a reputation as somebody who would). And they were not in any way out of line with baseball’s code. A large part of professional sports is about finding weakness in the opposition, then exploiting it. Rookies are constantly probed for chinks in their armor, as are veterans returning from injury. Look no further than Ted Williams, who as a 20-year-old rookie in 1939 was immediately tested by Browns manager Fred Haney, who knew him from their days in the Pacific Coast League. When the teams met in St. Louis, the first pitch Williams saw knocked him to the ground. It didn’t have the effect for which Haney had hoped, however, as Williams slugged the next offering off the wall in right-center field for a double. In his next at-bat, Williams was again thrown at and again hit the dirt. Again he responded, blasting a home run to right on an ensuing pitch. It wasn’t long before word circulated around the league that such tactics only made the slugger better, and pitchers quickly abandoned the strategy. Wright was clearly upset at Sanchez’s pitches, and eventually struck out on a fastball. With that as the result, he can expect similar treatment throughout the year. 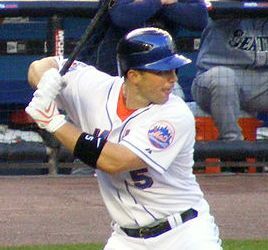 It will serve as an easy way to take the Mets’ best hitter out of his game. The only way it’ll stop, of course, is for Wright to disprove the theory. A gapper or two following a pitch similar to those from Sanchez would be a good start.